This necklace says it all. 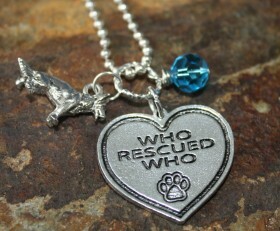 Beautiful heart “Who Rescued Who” charm with a dog breed charm and Swarovski crystal in the color of your choice. Add a Custom Stamped charm with the name of your rescue dog. Categories: Animals, Dog Breed Jewelry, Dog Lovers Jewelry, Dog Necklaces, Rescue Dog Jewelry, Valentines Day.